¶ 1 Leave a comment on paragraph 1 0 Digital history is public history: when we put materials online, we enter into a conversation with individuals from all walks of life, with various voices and degrees of professionalism. In this essay we discuss our experience in relinquishing control of the historical voice, to crowdsource cultural heritage and history. What is the role of the historian when we crowdsource history? Whose history is it anyway – the historian’s, or the crowd’s? Which crowds? ¶ 3 Leave a comment on paragraph 3 0 Roy Rosenzweig has made the case for the need for historians to engage audiences outside the discipline, as well as the power of historical narratives to bring about social justice.4 On a similar note, Carl Becker in 1932 took part in what was already an old discussion about the professionalization of history when he wrote, “If the essence of history is the memory of things said and done, then it is obvious that every normal person, Mr. Everyman, knows some history.”5 In the age of Wikipedia as the go-to place for historical knowledge, and increased funding cuts to humanities research, the need to reach out to the public has never been greater. Edward L. Ayers argued that, while a “democratization of history” has taken place since the emergence of new historical fields in academia, a “democratization of audience” has yet to come.6 Digital history has the potential to address these concerns by linking members of a community together to collaborate on historical projects. ¶ 4 Leave a comment on paragraph 4 0 Nevertheless, the internet is not an inherently even playing field; to digitize is not to democratize.7 Technical literacy, closed search engine algorithms, unequal access to quality hardware and poor internet connections mean that there is a disparity among users in the ability to manipulate the internet for their own purposes.8 Colleen Morgan points out that “…[the audience for digital work], when even considered, is almost always assumed to be male, white, western users of technology, a broadly defined ‘public’ for whom digitality is an obvious boon.”9 To put historical materials online is not a neutral process; to ask the crowd to solve a problem has the effect of creating self-selected groups, people who participate not just by interest, but also by technological proficiency. ¶ 5 Leave a comment on paragraph 5 0 Our own project, which we christened HeritageCrowd (Figure 1), attempts to take these issues into account as we provide tools for the group expression of local history and heritage in certain rural communities in Eastern Canada, using low-tech ‘old digital media’ such as short-message service (SMS) and voice mail, built into a web-based system.10 We wanted to bring the potential of digital technology to bear on a region with relatively low internet access, but also a relatively high interest in local history. ¶ 6 Leave a comment on paragraph 6 0 Figure 1. 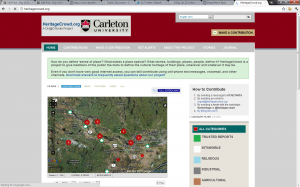 Screenshot of the main HeritageCrowd Project page. ¶ 8 Leave a comment on paragraph 8 0 Figure 2. Screenshot of ‘Stories from the Crowd’. ¶ 10 Leave a comment on paragraph 10 0 Figure 3. Screenshot of an individual report page. In the initial proposal for this project, we were particularly interested in trying to address the rural/urban digital divide in Canada using the SMS system as its backbone. 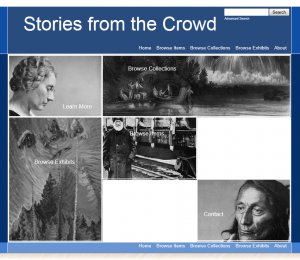 We asked, can public history be crowdsourced? What does that even mean? How could the SMS system be used to collect local knowledge of heritage resources? What can be curated in this way? In what ways would such a system change the nature of local knowledge, once that knowledge becomes available to the wider world on the web? ¶ 12 Leave a comment on paragraph 12 0 Figure 4. 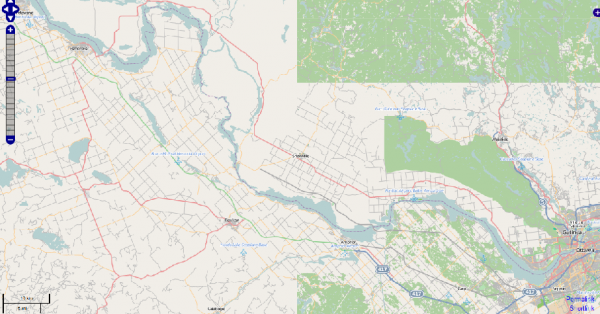 Open Street Map view of Pontiac and Renfrew Counties, centered on the village of Shawville, Quebec from http://osm.org/go/cILT2k. The City of Ottawa, Ontario, is in the bottom right. ¶ 13 Leave a comment on paragraph 13 0 We targeted a local area with which we were familiar, Pontiac county in Western Quebec (Figure 4).16 Internet connectivity in Pontiac has only recently transitioned from dial-up internet connection.17 More importantly, over half the population does not have a high school diploma,18 an indicator of low internet use.19 The Pontiac’s sister county in the neighboring province of Ontario, Renfrew, was also a target region for similar reasons.20 Both of these counties together are known as “the Upper Ottawa Valley.” Could a low-tech approach to crowdsourcing history reach this particular crowd, and what kind of history would emerge? ¶ 14 Leave a comment on paragraph 14 0 Strong institutional narratives were already at play, given the provincial boundary between our two target counties. Education is a provincial responsibility in Canada, and the Province of Quebec teaches a very different historical narrative than the Province of Ontario.21 The history of the regions, and of minority groups, does not have any real role in “official” history as it is taught at the high school level. Our project then has the political and social goal of validating those marginalized histories, to give a sense of legitimacy to the historical narratives of the local community. This made us question the role of the historian in this context; by crowdsourcing local history, we had transcended the traditional role of the historian as being an arbiter of historical truth.22 Historians who crowdsource the writing of historical narratives may be able to empower members of a given community who may not have the same institutionalized or professional authority conceded to “experts” in the discipline. This mission is distinctly different from that of most academic historians, whose work is centered around the construction of historical narratives based on the analysis of sources, and that of the museum or public historian, which attempts to provide an impartial and objective narrative of the past for public consumption. In order to encourage submissions from visitors to the website, we created a number of reports to “seed” it, assuming that visitors would be less likely to submit reports if the site was empty or contained few reports. As of the end of July 2011, we have received 25 reports (5 voice mail contributions, 7 SMS contributions, and 13 e-mails, from unique contributors), and the site has 50 reports listed (this number includes the previous amount plus reports submitted via the website). At the time of writing, the site had been open to the public for a total of 54 days. As the Upper Ottawa Valley has a population of approximately 90 000 people, suggesting about one in four thousand people living in the targeted area made a submission to the project. From a technological point of view, our mission was simply to give people the digital tools to more easily express and share their sense of heritage and local history. During the course of the project, however, it became evident that a second crowdsourcing method could be used for a similar goal. This approach, which could be called “retroactive crowdsourcing” for lack of a better term, involves gathering representations of local history and heritage from disparate online sources that already exist and collecting them in an online database.25 This is different from our original concept of crowdsourcing where we actively solicited submissions to our project from a wide community. ¶ 19 Leave a comment on paragraph 19 0 Indeed, that example shows that in one sense our project’s focus was misplaced. Crowdsourcing should not be a first step. The resources are already out there; why not trawl, crawl, spider, and collect what has already been uploaded to the internet? Once the knowledge is collected, then one could call on the crowd to fill in the gaps. This would perhaps be a better use of time, money, and resources. ¶ 20 Leave a comment on paragraph 20 0 In hindsight, one of the ways in which the project could have attracted more submissions lay in implementing what Jane McGonigal calls “classic game rewards”—in other words, building a series of game-like mechanics into the project. These include giving the participants “a clear sense of purpose,” as well as giving them the impression that they are “making an obvious impact” and “continuous progress.”28 “Gamification” is a troubled term, in that while it implies using the classical tools of games to foster engagement, it can also be taken to suggest the trivialization of the task at hand, or worse, exploitation of the user/visitor.29 Be that as it may, McGonigal does cite major crowdsourced collaborations such as Wikipedia as being successful because of its subtle systems of rewards, satisfaction, and to some extent, social interaction.30 HeritageCrowd could foster engagement through its “comments” feature on the individual reports in the Ushahidi platform, but here we have a clear case of where the technology, the medium, shapes the message: Ushahidi is for quickly reporting crisis incidents, not for fostering a dialogue about them. A great deal of modification needs to be done to the core platform for our purpose, perhaps by merging the reporting system with the auto-creation of Wiki pages. ¶ 21 Leave a comment on paragraph 21 0 Although the accumulation of reports on the Ushahidi-powered website’s map could be seen as an indicator of progress over time, these reports first had to be approved by us before becoming visible (a decision taken to filter out potential spam or otherwise unsuitable material). The instant satisfaction of having made a contribution to the project was therefore lost. Similarly, one would not have been able to track one’s own individual progress (i.e., with a personal account and information interface that lists the number of contributions). Further development of the Ushahidi platform, or the use of an additional platform to track this data for users, could provide this benefit. ¶ 22 Leave a comment on paragraph 22 0 The concept behind the project (crowdsourcing local history and heritage using SMS networks and voicemail) proved to be an obstacle in some cases. When we visited community events or corresponded with individuals who expressed interest, some people were unsure what exactly we were asking them to do. This was most likely because the project was centered on a concept with which many people in the region were unfamiliar. We could easily explain it in person whenever we were asked about the project, but it is entirely plausible that some contributors made submissions to the project (by sending a text message or voicemail, for instance) without having fully understood how the submissions were compiled onto our website. (The article in the Ottawa Citizen was published digitally for a while with the headline, “Text if you are a descendant of Philemon Wright.”31 We duly received a number of text messages with the exact message, “I am a descendant of Philemon Wright.”) The layout of the main website also provides some confusion, as it is not immediately obvious how or what visitors actually do on the site. This confusion we believe was partly responsible for the evolution of the project from a tool where collaboration and community support was envisioned, a process of sharing authority, to one where we the historians seem to be using the crowd more as a reservoir, contrary to our intentions. ¶ 23 Leave a comment on paragraph 23 0 Finally, we had a number of potential contributors who were worried that what they had to contribute was not “professional” enough, and so were reluctant to actually contribute; in these cases, our role seemed to be to reassure them that what they knew, what they valued, did have “official” historical value. One community activist approached us with a body of materials that she had collected as part of a continuing negotiation with a local city council in Quebec over the development of a neighborhood. This neighborhood is predominantly Anglophone, while the city itself is largely Francophone. The history and memory of this one neighborhood was thus caught up in larger issues of identity, power, and institutionalized interpretations of history. The city council wishes to rezone the neighborhood to allow for high-rise condominiums. The activist approached us to see if we could “legitimize” what she had collected in the hopes of forcing the city to adopt specific heritage recommendations into its planning process. The act of collecting community knowledge, since it was being done via our university-funded project, seems to put an imprimatur of “truth” and legitimacy on anything submitted and displayed. The Ushahidi platform uses the terms “verified” on all submissions in the sense of crisis-management: that this actually happened. Our approach was initially one where we used the term simply as a spam-filter. Clearly, this was far too simplistic and carries implications far beyond what we initially imagined. At this early stage in our project, the single most important observation is the role our project seems to have in validating individuals’ and groups’ historical knowledge. Even if we have not yet collected masses of documentation, we provide a new avenue for non-professional knowledge to enter into the academic world of knowledge production. Consequently, by adapting a platform meant for one domain into another, there is procedural rhetoric that needs to be taken into account when designing how the project works.32 Our authority was not shared; rather, the platform and our use of it seem to have reinforced the primacy of the historian. ¶ 25 Leave a comment on paragraph 25 0 Were we to start this project over, we would spend more time modifying the basic platform to combat this. The terminology and structure of the platform as it currently stands give more authority to the data displayed than might be warranted. We had imagined that if a contribution was made that might not be factually accurate, or that carried political bias, a discussion would take place in the comments for that item and the issue would resolve itself (much like what happens on Wikipedia). This has not yet happened. It could also be that the fact that this project is university funded, carried out by university researchers and students, also gives immediate “weight” and authority to anything displayed on the website, thus inhibiting discussion. Seed your site with this material so you can identify the gaps. Narrow your target when communicating with the public: get them to fill the holes. Make sure to design for engagement. Building your crowd is key: put initial resources into publicity. Get out and walk the walk, and talk to people. Identify, contact, and cultivate key players. Have an “elevator pitch.” Make sure that the project can be described completely in 30 seconds or less. Build your outreach and social media strategy around getting that pitch in front of as many eyes in your target crowd as possible. ¶ 28 Leave a comment on paragraph 28 0 The funding for HeritageCrowd was limited to only a few summer months. However, by using open-source, freely available software, its continuing operating costs run to that of maintaining the webhosting. We will be taking the lessons we learned in the summer of 2011 and using them to improve our approach. With time, we hope to reach more of our target audience. HeritageCrowd will also become a platform for the training of students in digital history, outreach, and exhibition. As we collect more materials, we will be developing the Omeka-based “Stories” part of our site, allowing individuals, societies, students, and researchers, to tell the stories that emerge from the crowdsourced contributions. It is still our hope that the role of the digital historian may be able to be distanced from that of the expert, dictating historical narratives from an academic podium, toward an activist role for grassroots community empowerment. Digitally crowdsourced history has the potential to be like a cracked mirror: it could reflect what looks into it, and while it might not (cannot?) produce a polished, singular view, the aesthetic pleasure will lie in the abundance of perspectives that it provides. ¶ 29 Leave a comment on paragraph 29 0 Acknowledgements: The HeritageCrowd Project was funded by a Junior Research Fellowship, 2011, from the Faculty of Arts and Social Sciences at Carleton University, whose support is gratefully acknowledged. We would like to thank James Miller, Jim Opp, John Walsh, Lisa Mibach, and the contributors to HeritageCrowd for their interest, support, and feedback. Errors and omissions are our own. ¶ 30 Leave a comment on paragraph 30 0 About the authors: Shawn Graham is Assistant Professor of Digital Humanities in the Department of History at Carleton University. Guy Massie is now an MA student in the History Department. Nadine Feurherm is now a second year Communications Studies student at Carleton.